Instead of just settling in for a long winter's nap I appear to be just waking up from a Thanksgiving coma...yikes! Every year the company that I work for closes for the week of Thanksgiving/deer hunting season...yes that's a real thing here in my part of the world. It's a week for spending time with family and of course quilting, quilting and quilting. I had huge plans for the week, that came to a screeching halt when I had to admit defeat to a sinus infection and rest. That's okay, I still got a few things finished. Like Jenny's birthday Christmas(?) unicorn quilt. I love the addition of the fractured borders and so does she! All that is left to do is work it into the quilting rotation so that hopefully it doesn't become her birthday Christmas New Years Valentines Day quilt. I also caught up on Cindy at Stitchin At Home's Medallion Quilt. 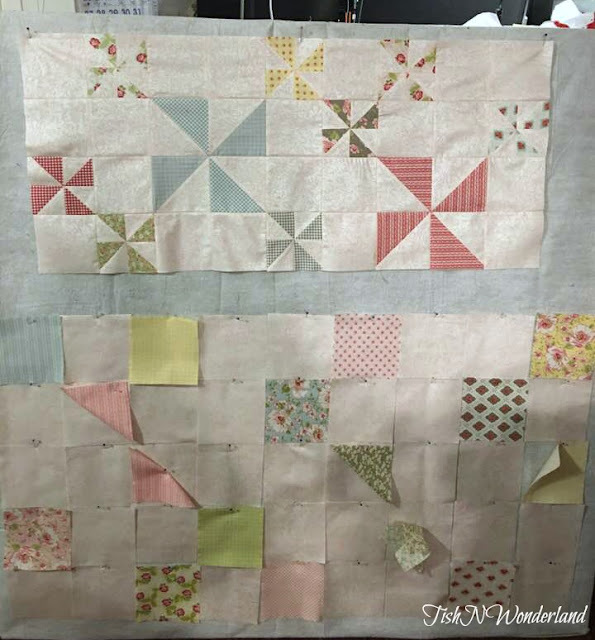 I don't think there are too many more to go, before this one can work its way to becoming a finished quilt top. and The Mouse and the Motorcycle were born. 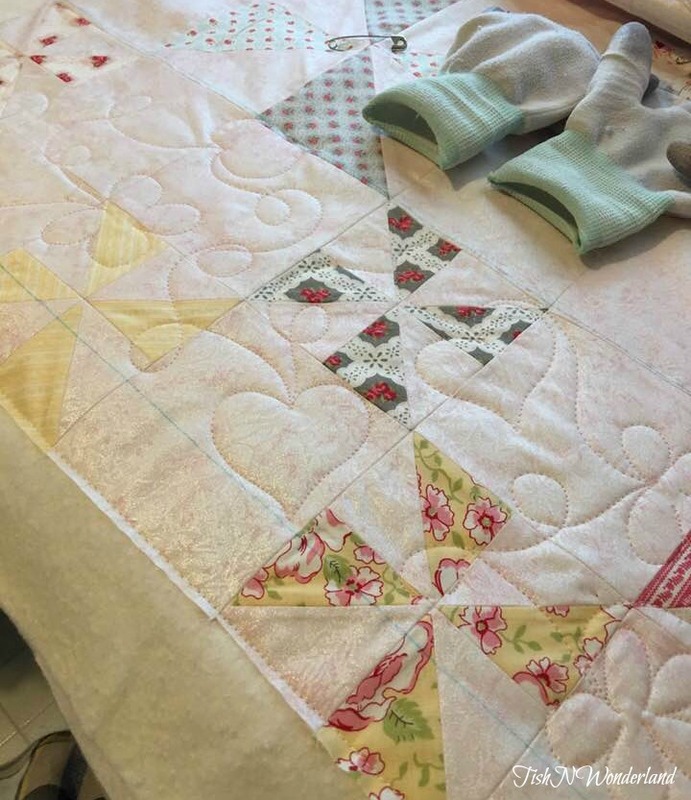 The time and date stamp fabric gave this quilt some crazy movement across the quilt. I felt like my eyes were crossing if I looked at it too long. I think the addition of the small yellow border helped tame some of the craziness and help the eyes find a place to land before the really cool book border fabric. Sadly, this top is headed to join the 2015 and 2016 BOM's in UFO land (2014 is actually a finished quilt), until I get my act together. 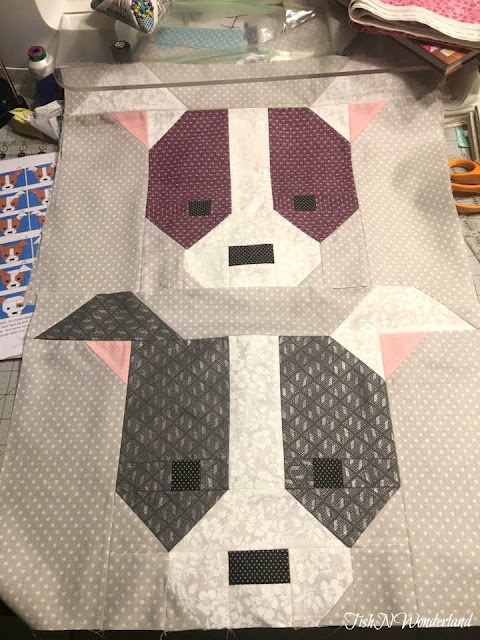 I do have a small quilt finish in the form of puppies, but we will save that for it's own little post. So I am back and feeling so much better. I still have quite a few items on my list to finish, but all in good time. 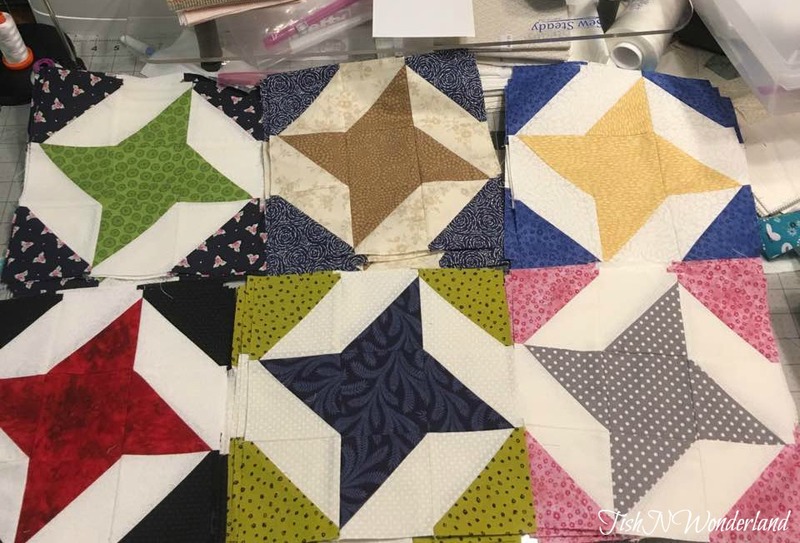 I hope everyone had a wonderful holiday and was able to sneak in a bit of quilting time. Today I'm linking up with Let's Bee Social and a very special edition of Midweek Makers...the 100th edition!!!! A finish! A finish! I have a finish!! One thing marked off the list of to do's. 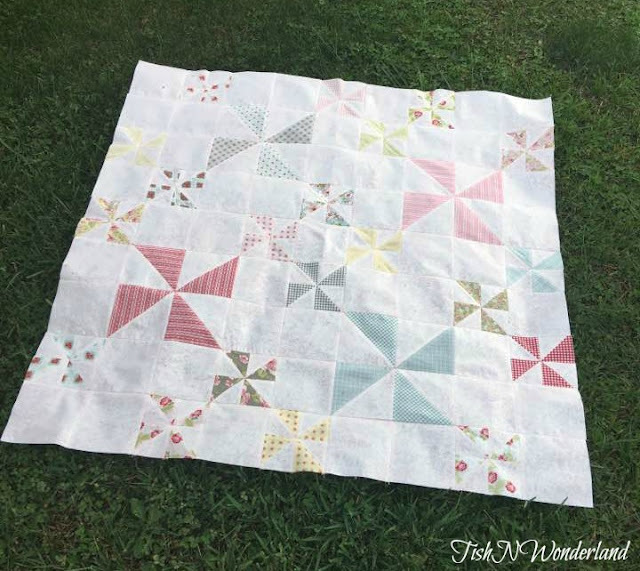 This is the Windy Days Quilt by Sarah Meyer for Moda Bake Shop. I've had this quilt on my bucket list for a while now and a co-worker expecting a baby was the perfect excuse to make it. 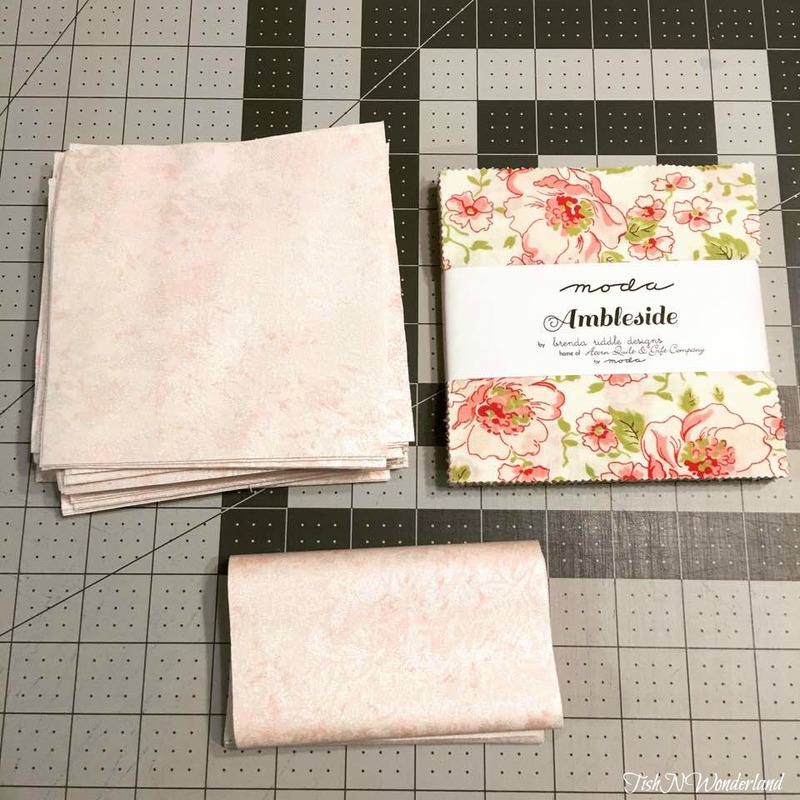 It started off life as this beautiful charm pack of Ambleside, yardage of Michael Miller Fairy Frost and some yardage for backing. You might remember my slight melt down of thinking I didn't have enough 5" squares of the background fabric. I learned an even bigger lesson: read your pattern completely and thoroughly before you start cutting. The pattern actually calls for two charm packs of background fabric (which I cut from yardage). I could have save myself a ton of time and worry. I really didn't need as many squares as I thought I did. I trimmed most of those 5" square down to 4.5" anyway. If I had gave the pattern my 100% attention I would have figured that out way sooner and saved my rotary cutter blade. Live and learn. After all my pieces where trimmed I decided to lay everything out on the design wall to keep myself straight. At this point, I was questioning my decision. I just wasn't seeing my own vision marrying these fabrics to this pattern. I continued to push forward. 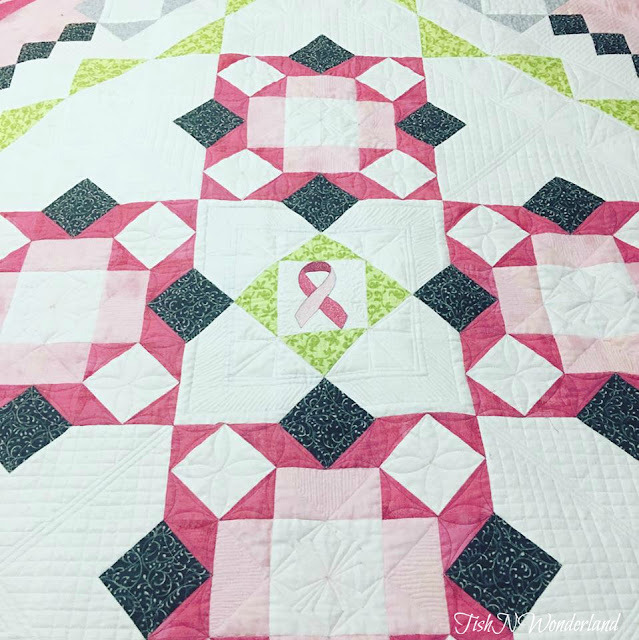 As my pinwheels formed and rows came together, the quilt came to life. Surprisingly, this quilt came together super quick. The smaller pinwheels are formed by making four half square triangles all in one whack. With a finished top, it was time to think about quilting. I wanted quick and easy. I searched on Pinterest for edge to edge design ideas. I wanted to try something other than stipple or loops. I found a pantograph design that looked like it wouldn't be too hard to free hand stitch and printed it out for reference. I decided to try something a bit new to me. Normally, I would just sit down and quilt something like this, no marking, quilting willy nilly. 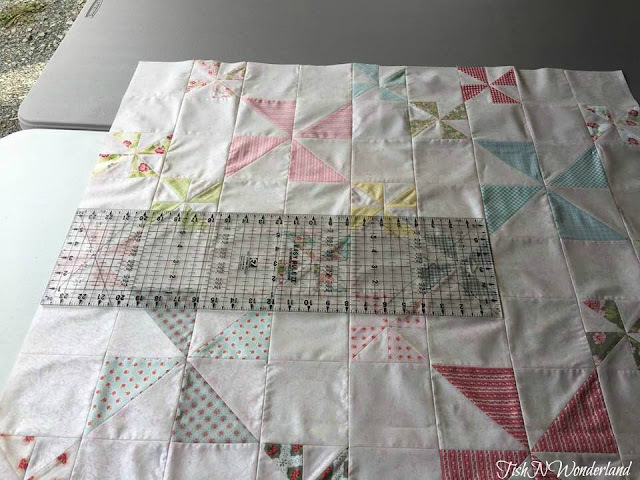 This time, I marked 6.5" registration lines on the quilt and would fill the spaces with the design, like a pantograph. I pinned the print out of the pantograph to the wall above my Sweet Sixteen so that I could reference it from time to time. 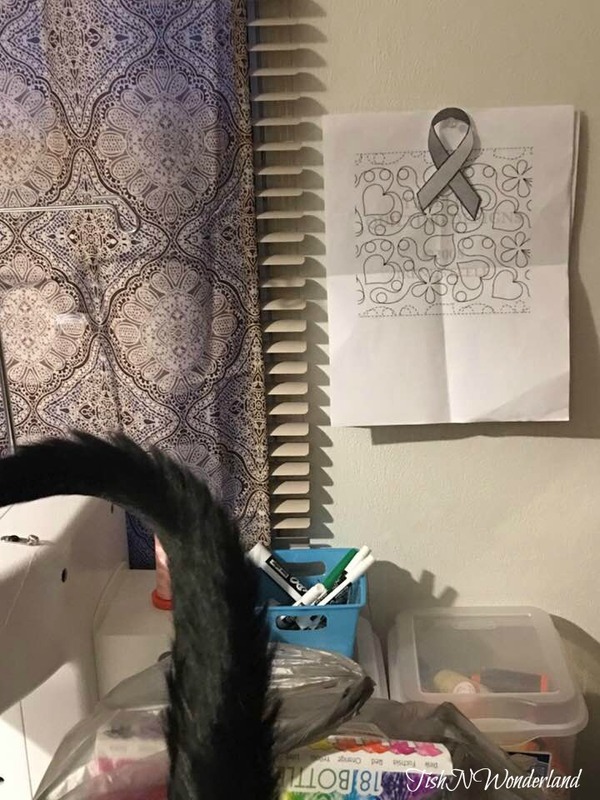 A big thanks to Oliver for the tail shot. I guess he misses being on camera...he butted in. I have to say, I really liked stitching the design this way. The lines helped me to keep the motifs in proportion and spaced nicely. Did I stay between the lines? Of course not and that's okay, I wasn't necessarily trying to. The goal was to fill the spaces as evenly as possible. 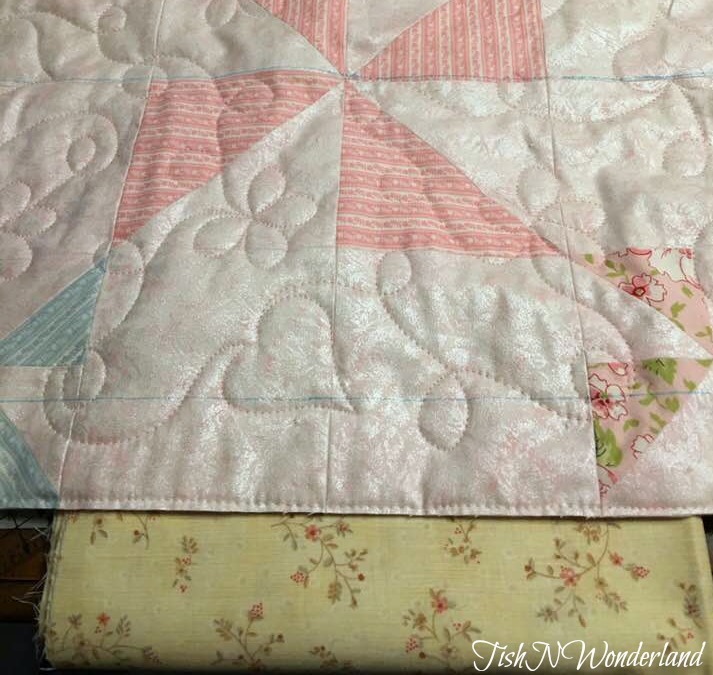 I quilted the top using Aurifil #2423 Baby Pink on the top and 2021 Natural White in my bobbin. Both threads melted beautifully into the background leaving a wonderful soft texture to the quilt. The binding was this pretty little yellow print and a white on white from my stash. At the last minute, I decided to back the quilt in this soft flannel. I'm not sure I'm in love with the shade of pink this flannel is when combined with the fairy frost on the front, but it's not bad. This quilt was made to be used, and that flannel is just so soft...no regrets. The little girl this quilt was made for is one week old today and it will be united with her very soon. As always, my wish for this quilt is lots of snuggles and laughs and that it will bring years of comfort to her. That wraps up my finish for this week. I'm still looking for some sunshine to take pictures of the Butterfly quilt. Hopefully, I can share it with you next week. I may be silent for the next few days, with the Thanksgiving holiday knocking on our doors. So I wish you all a wonderful week next week, just incase I disappear. Today I'm linking up with Finished or Not Friday and Can I Get a Whoop! Whoop! Last weekend, I was able to quickly whip up my Wayward Transparency blocks and I popped outside (while there was a shimmer of sun) to take a picture of what I was confident would be my quilt layout. Then Facebook happened. After seeing all the different layouts everyone was trying, I decided to start turning my blocks to see what would happen. So now who knows what I'll use. Maybe I will do drawings of the layouts and start thinking about quilting designs. That just might be the answer to the layout conundrum...that and stay off Facebook. Then we have this fabric pull of cute little gray and white dots and a fun shiny gold FQ bundle. 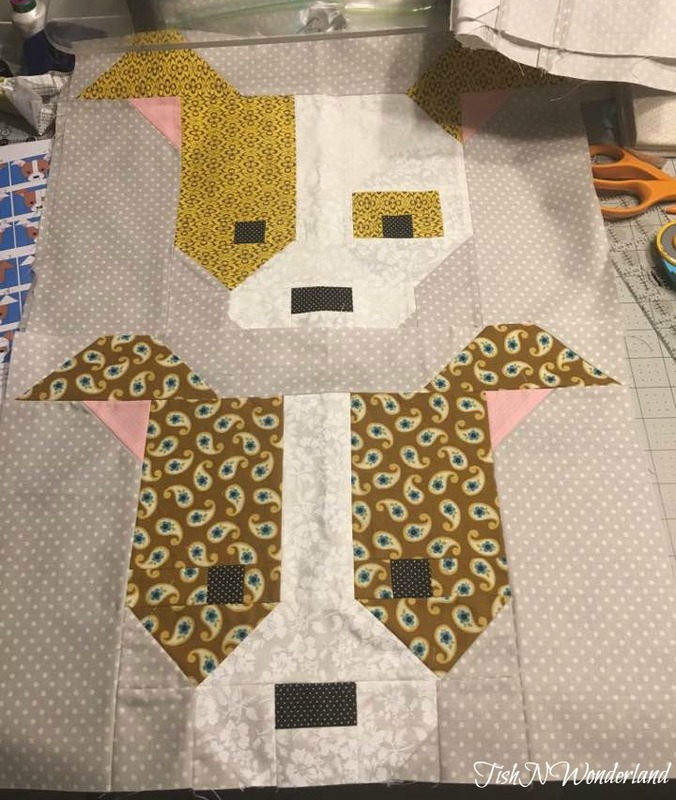 I decided that these fabrics would be perfect for making Dog Gone Cute blocks to send to Karen to help with her disaster relief efforts from the hurricanes. Look at all these beautiful blocks (and it's not even half of them)! These are some of the blocks I received from the guild's block exchange Monday night. So many beautiful fabrics. I hate to do it, but I'm going to have to pack them away for just a little bit, till my sewing room gets back under control. The good news, is I should start gaining some finishing ground. I have the Windy Days baby quilt and Butterfly Meadow Mystery all finished up. I'm just waiting for some sunshine so I can take pictures and tell you all about them. So fingers crossed....some sort of finish for Friday. I don't have any finishes to show off quite yet, but I can see the ship sailing on the horizon. Last night, I plugged in the ol' Sweet Sixteen to check my tension and practice a design. I've been searching around on Pinterest for quilting ideas. I am in need of some edge to edge designs to finish up some quilts. Above was my attempt to free hand recreate the look of one pantograph I loved. Not too bad, if I say so myself. 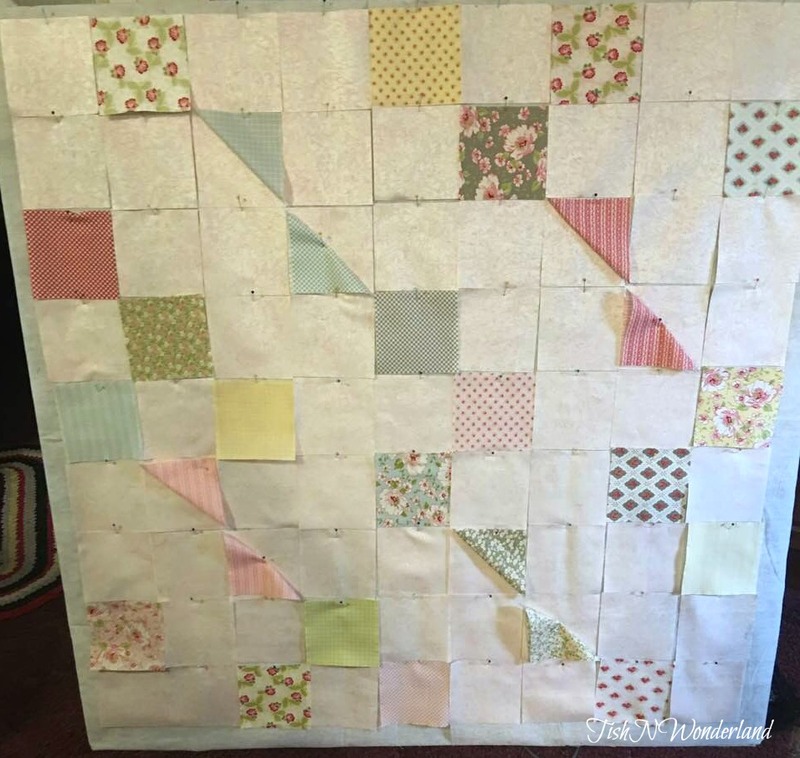 I will be using it on this baby quilt, I finished piecing last weekend. I'm going to try something a bit different than I normally do. Starting in the middle of the quilt, I will mark myself some 6" spaced registration lines to stitch the filler in between, working in rows...kind of like a pantograph. I'm hoping this will help me with keeping the scale of my motifs evenly spaced and the same size. I find when I'm just meandering willy nilly, it's easy to start small and get big and vis versa. 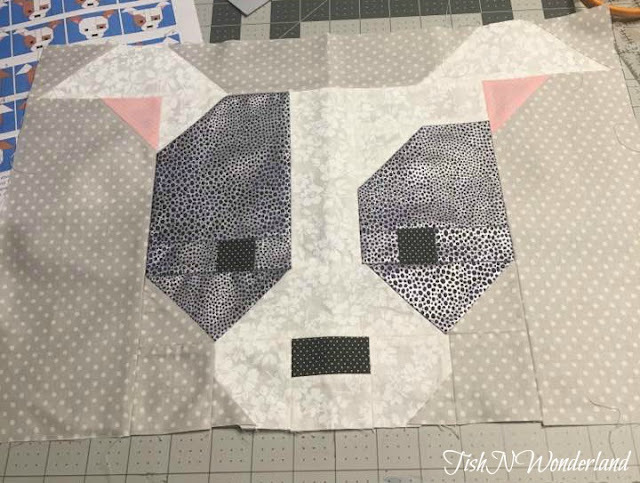 We will talk more about his quilt and my 5" square dilemma when it's finished next week. 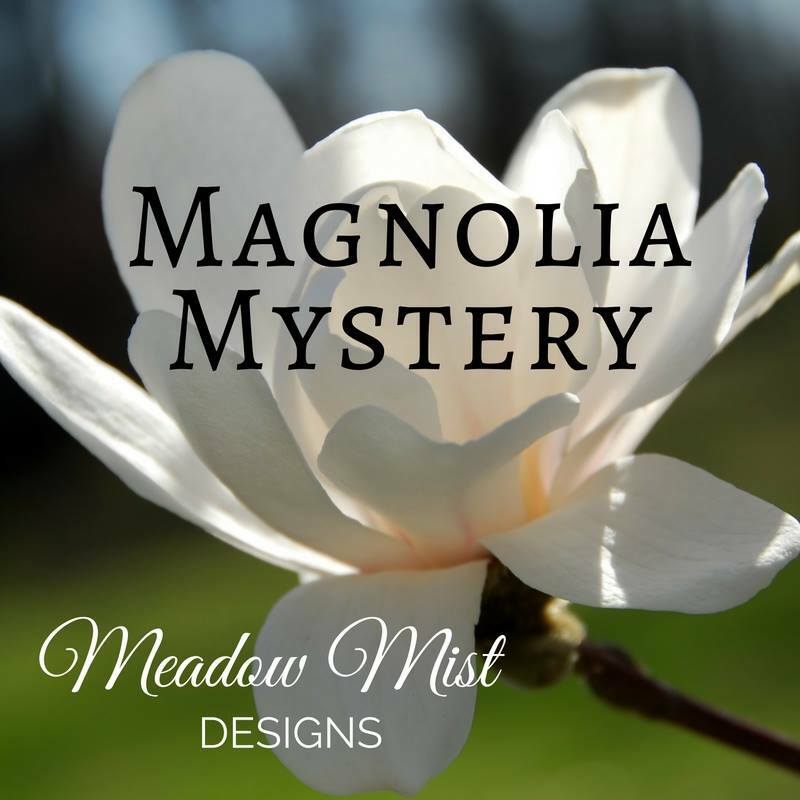 Remember the Butterfly Meadow Mystery Quilt? I finally finished stitching the last 4" square last night. I know it took weeks to get brave enough to do it, but we've all been there, right? I faced my fear and stitched the pink cancer ribbon the customer requested be on the quilt and I have to say all in all, I'm happy with it. I traced the outline of the ribbon with a blue water soluble pen then outlined it in dark pink thread. I thread painted the ribbon using a scribbling technique then added back ground fillers to help it pop a bit. I will get it bound, washed and blocked over the next few days and hope to give it a photo shoot before it heads to its new home. So what else has been going on? I think I might be the only person in America celebrating the Daylight Savings time change. Are you kidding me, it's my favorite time of year!!! I gain a whole hour to my day!!! I could sleep. I could quilt. The possibilities are endless. Yes, it gets dark at 5 PM, but if you close your windows and turn lights on you never know that. With the extra time, I have went into full on puppy mode. I still have a few more to go, but they will sew up super quick and then guess what? I'll have yet again another quilt top to quilt. Quilt tops, quilt tops. Man, oh, man. What am I going to do? Well, I have some ideas. I've admitted before that I have a ridiculous amount of tops that need quilted. I'd blame Dave, but he's only been quilting for a year and a half so that doesn't seem fair. Do you have unfinished projects you would like to finish up? I've been bouncing around the idea of creating a party for those of us that do. Maybe we can turn it into a game? Make a list of our quilt tops, draw a number each month and let fate decide which project we work on or you could just choose yourself. Maybe a link up at the first of the month, introducing our project and talking bout why we abandoned it in the first place. Or maybe you need some help in figuring out how to proceed? We can all give advice. Then a link up at the end of the month to show your progress or your finish. I thought I would put this feeler out there to see if anyone had any interest in such a party. Maybe at the end of the year we could have a parade of our finishes and I could round up some prizes for all our hard work. But really at the end, we will all be winners...we finished projects! 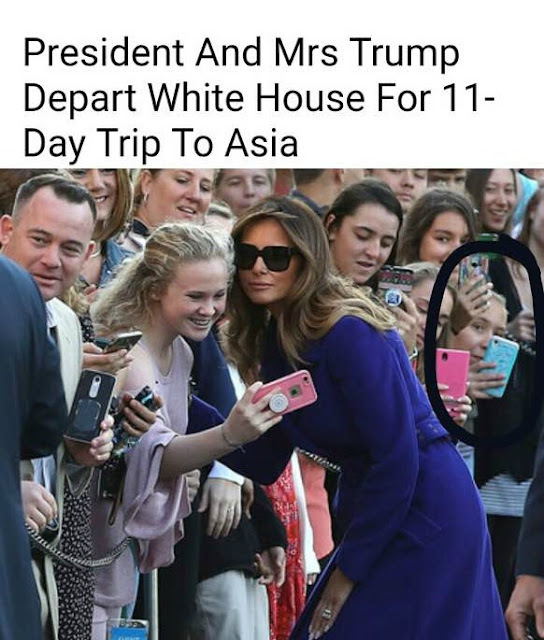 There she is, phone in hand taking pictures. 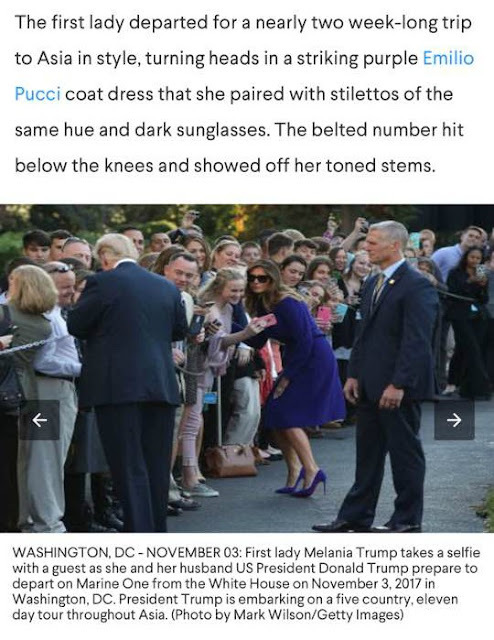 Sometimes being short is quite the advantage...you can sneak to the front of crowds. Today I'm linking up with Let's Bee Social and Mid Week Makers.